The healthcare sector is one of the world’s fastest growing industries, employing more than 10% of the overall workforce. The bulk of developed countries are spending more than 10% of GDP on healthcare, a 3% increase over the last decade. Low and middle-income countries have also seen an increase in spending, reaching 5-10% in recent years. Despite the growth of the industry, over 400 million people lack access to essential healthcare services (World Bank.) Patients with mental illness face increased service costs and patients with multimorbidity are more likely to receive ineffective care. Further, the healthcare industry is growing continuously complex, with issues such as aging populations, health inequalities, and increases in non-communicable diseases. Are current healthcare services equipped to deal with the rising challenges? Arguably, there is a need for a redesign of the healthcare structure. Costs should match the quality of service, promoting quality care across sectors and improving patient and provider experiences with efficiency and effectiveness. 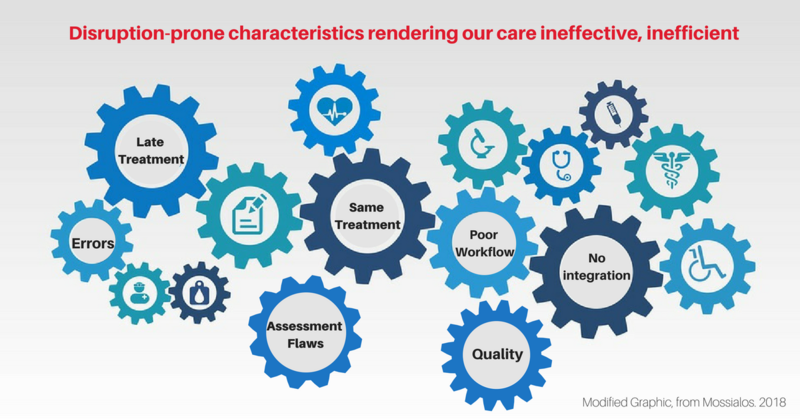 Currently, there are several factors that result in subpar healthcare, such as delayed treatment, non-personalized treatment, administration error, ineffective treatments and interventions, inefficient workflows, and patient error. Many of these shortcomings are do to the current characteristics of the healthcare and hospital structure. Instead of rewarding health outcomes, unit costs are rewarded. There is an insufficient focus on individualized patient care and treatment success, with payments made for unproven services. The hospitals of the future must transform into value-based care systems, with an integrated method and increased accountability to whole population health. From 1995- 2014, China’s healthcare spending increased from 3.5% to 5.5%, matching the global trend of increased healthcare spending. 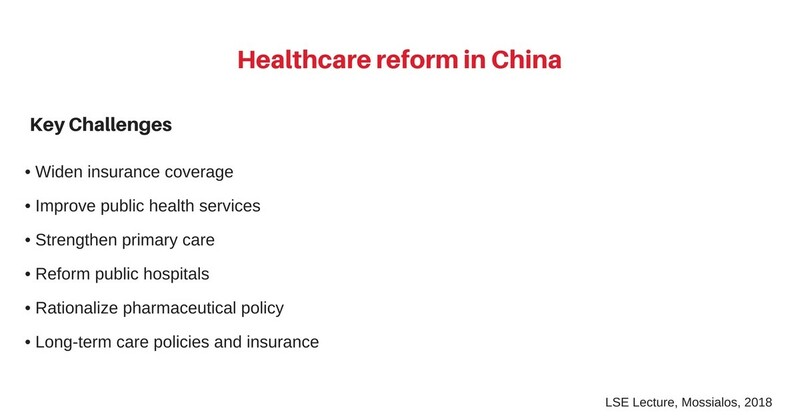 Since the late 1990’s, China has been undergoing healthcare reforms, resulting in near-universal health coverage by 2011. (Zhang, Nokoloski, and Mossialos, Social Science and Medicine 2017) China’s health insurance has reduced out-of-pocket costs, particularly for lower and mid-income patients. However, China’s social healthcare still holds challenges. Rural healthcare schemes in China have fallen behind urban healthcare development and rural migrants bare the brunt of the shortcomings of the healthcare system, rarely benefiting from insurances. The age structure of migrants has also changed, with elderly migrants rising from 1% to 18% between 2008 and 2015. Further, China’s hospitals are overcrowded, due to patients opting out of primary care. Healthcare issues are vast and complex, integrating challenges from economic, social, and environmental perspectives. Professor Mossialos’s insights present a comprehensive path to transforming health systems economically and socially. REEI is excited to lead future discussion from an environmental standpoint. Not only must we face the challenge of integrating health insurance considerations into policy, the innovations must be made to the healthcare industry in the context of the environment. February 6th, REEI will be cohosting Climate Smart Health Care report release and seminar. Please stay tuned to our social media channels and website for more information. Updates of REEI’s events, attendances, publications are available on the REEI website, WeChat, Facebook, and LinkedIn.